South Korean President Moon Jae In welcomed top North Korean official Kim Yong Nam to the Winter Olympic Games “of peace” Friday, but Vice President Mike Pence kept up efforts to derail détente between the two republics. On his arrival in Pyeongchang earlier, Pence insisted that the North must give up its nuclear weapons as a precondition for talks on denuclearizing the Korean peninsula. “Then and only then will the world community consider negotiating and making changes in the sanctions regime that’s placed on them today,” he said. In a meeting with Moon the day before the Olympics opening ceremony, Pence pressed South Korea to take a harder line against the North. He expressed the Trump administration’s opposition to the conciliatory note that has been struck in North-South relations in recent weeks. 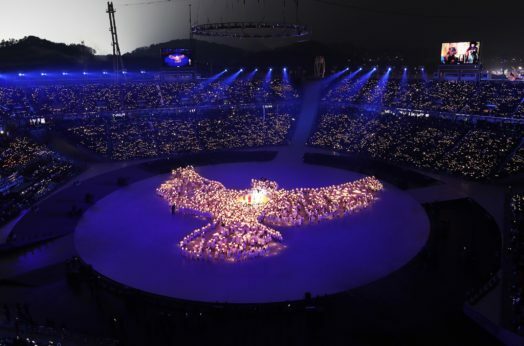 With North and South Korea fielding a joint women’s ice hockey team and hundreds of North Korean musicians and martial artists performing during the games, Pyeongchang has become a symbol of peace. But the hawkish Pence urged President Moon not to allow Pyongyang to use the games for “propaganda,” repeating rhetoric he had spouted in Japan the day before. Japanese Prime Minister Shinzo Abe, a fellow hawk, warned the South not to fall for what he called North Korea’s “smile diplomacy.” While visiting Abe, Pence announced the U.S. would pursue the “toughest and most aggressive sanctions yet” on North Korea. Spurning Pence and Abe’s warnings, however, Moon declared that the landmark sporting event would be the “Olympic Games of Peace,” and said it could be a first step toward denuclearization. In a further snub to Pence, Moon had lunch with the North Korean delegation on the day of the opening ceremony. When the athletes of North and South Korea marched into the stadium together on Friday night under a unification flag, Pence and his wife Karen were the only two to sit silently while the crowd of South Koreans and international attendees stood and cheered. The final handoff of the torch relay, completed by one athlete each from North and South Korea carrying the Olympic flame together up to the cauldron, showed that Korean people—on both sides of 38th Parallel—were not on board with the Trump administration’s preferred divisive means of settling the issue of nuclear tensions on the Korean peninsula. He then criticized the North for holding a military parade on Feb. 8, the day before the Olympics opened, calling it “an ongoing provocation.” On Feb. 7, it was announced that President Donald Trump had requested the Pentagon to organize a “grand military parade” through Washington, D.C. This article combines content from Morning Star, the Associated Press, and other sources.